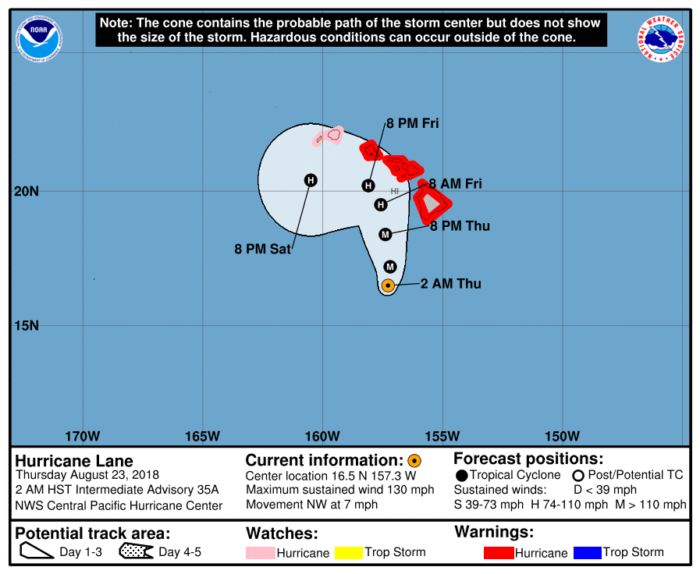 Hurricane warnings are in place for most of the Hawaiian islands today as major Hurricane Lane continues its trek towards the popular vacation destination. President Trump issued an Emergency Declaration as residents continue last minute preparations. Hurricane Lane remains a category 4 storm with maximum winds of 130 mph. Although some weakening is expected within the next 24 hours or so, Lane will remain a powerful hurricane as it approaches Hawaii. The main threats for the Hawaiian islands remain unchanged. Hurricane force winds are expected today and tomorrow as Lane passes dangerously close to the island chain. Torrential rainfall is already occurring with some spots seeing nearly a foot of rain. Local authorities are reporting a landslide near Honomu and flash flooding in Hilo. Flash flooding and mudslides will continue to be a possibility on all islands over the coming days.